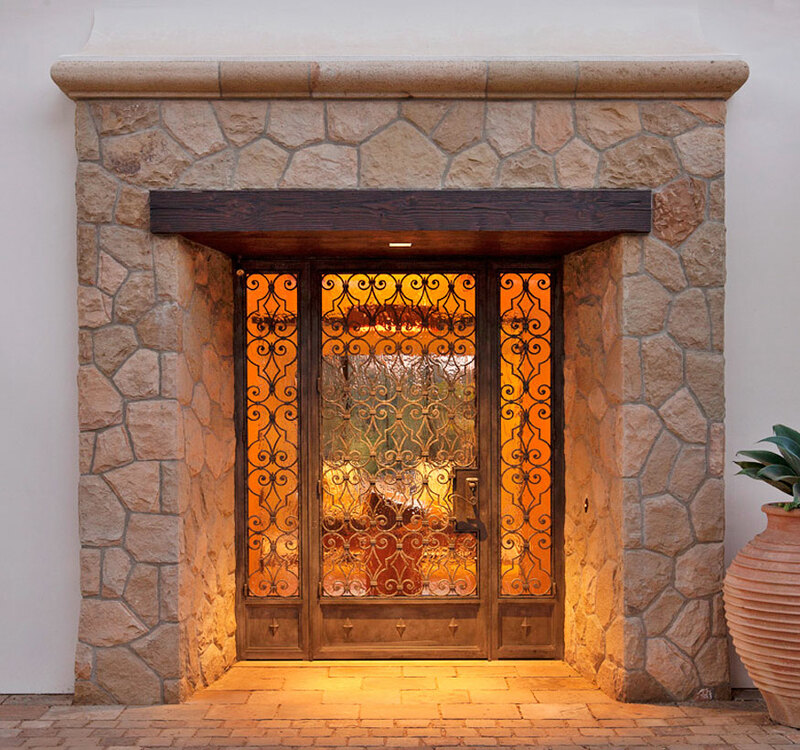 In addition to the ornate wrought iron entryways that are traditional to the Mediterranean and Spanish architecture so popular in California, Ironwood Designs also specializes in manufacturing custom metal doors and windows that incorporate a very low profile sash and minimal visual obstruction. 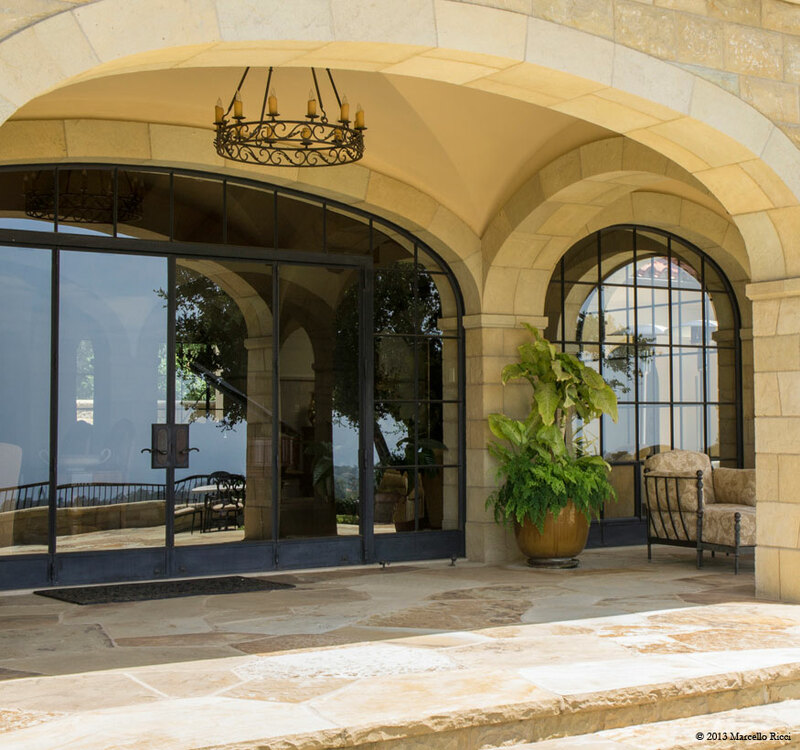 Regardless of style or tolerances, doors and windows built by Ironwood Designs optimize structural integrity with a minimal use of material. They are built to the highest standards, and designed to last a lifetime. Custom hardware and finishes are available. Ornate Iron Entry Door The scrolls of this repeat, geometric iron pattern set the tone for the beautiful home within. DesignArc Architects, built by Ironwood Designs. 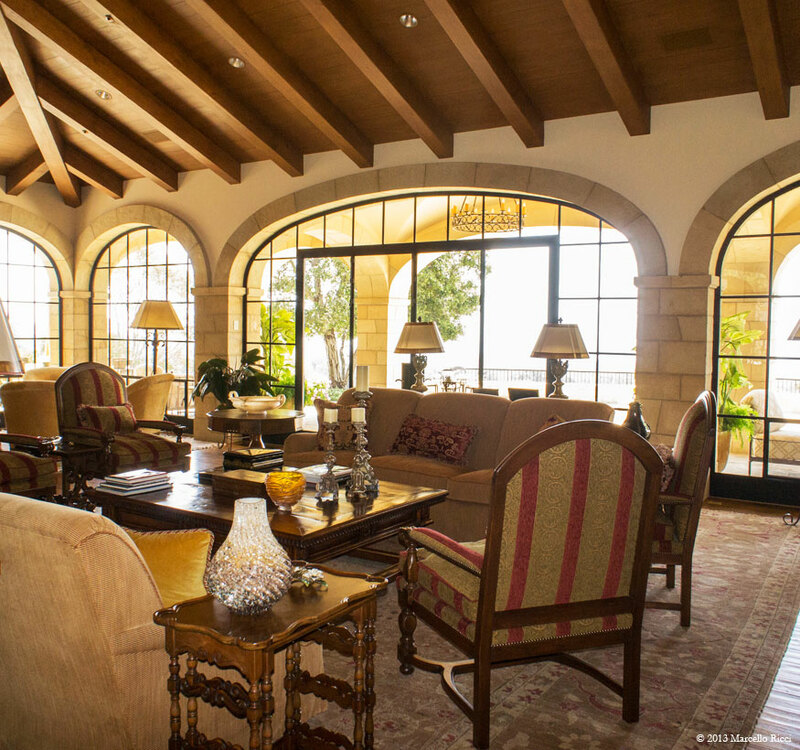 Steel Doors and Windows Designed by Bob Easton Architects, Ironwood Designs built these metal doors and windows to fit the stone arches of this Montecito home. Interior View of Steel Doors and Windows Minimal sash profiles and bifold doors combine to bring the expansive views inside. 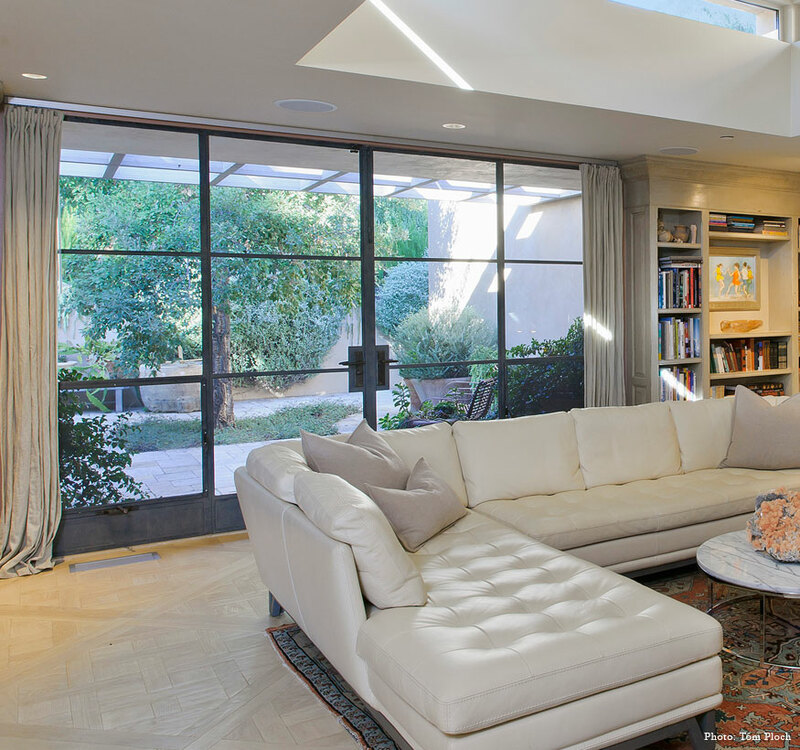 Designed by Bob Easton Architects, built by Ironwood Designs. 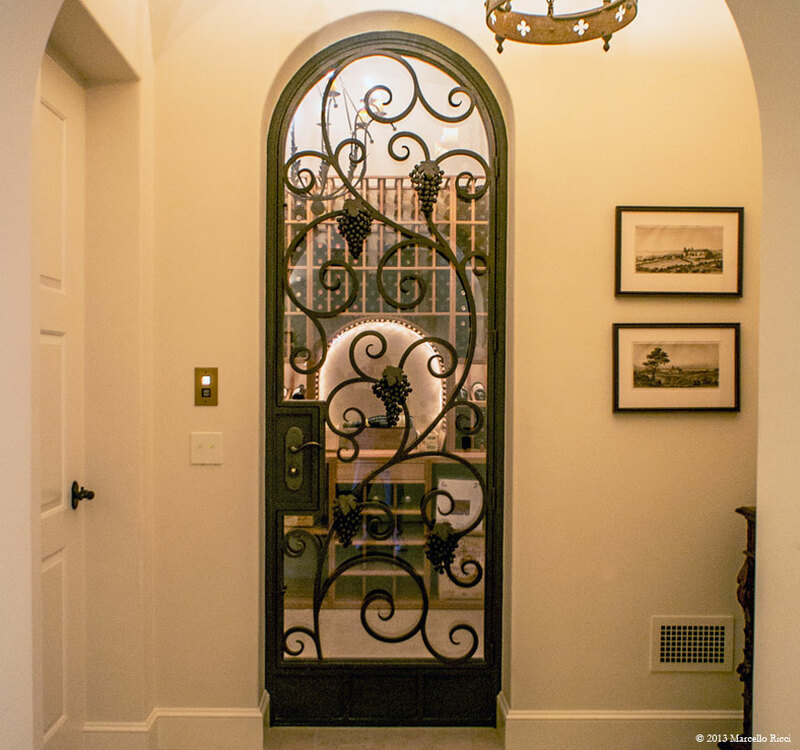 Ornate Iron Entry Door Picture taken from inside the beautiful front entrance of this Montecito home. Iron pattern by Bob Easton Architects, built by Ironwood Designs. Wrought Iron Wine Cellar Door Custom, 9 foot tall wrought iron wine cellar door, adorned with grape cluster details. 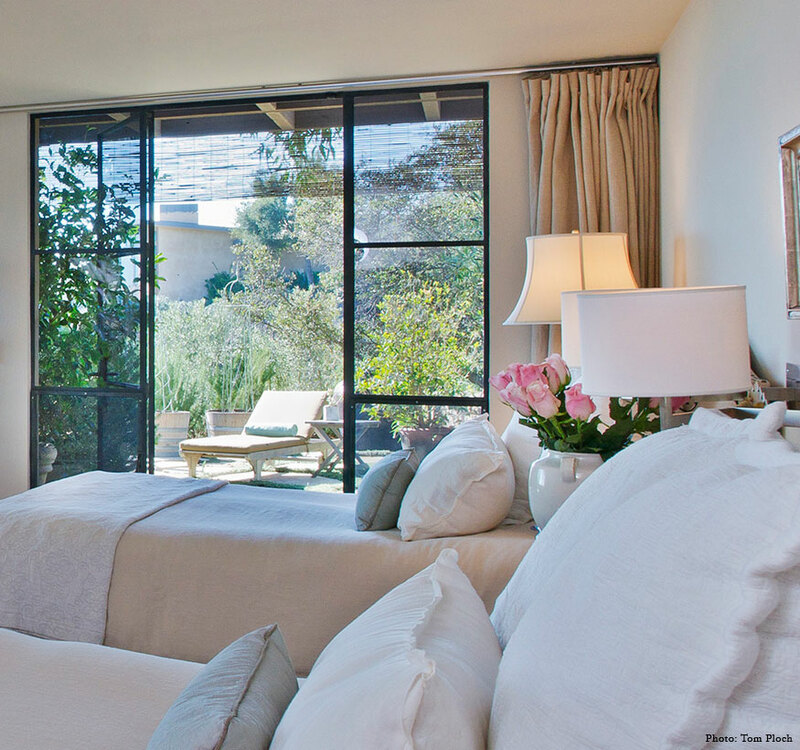 Designed by Bob Easton Architects, built by Ironwood Designs. 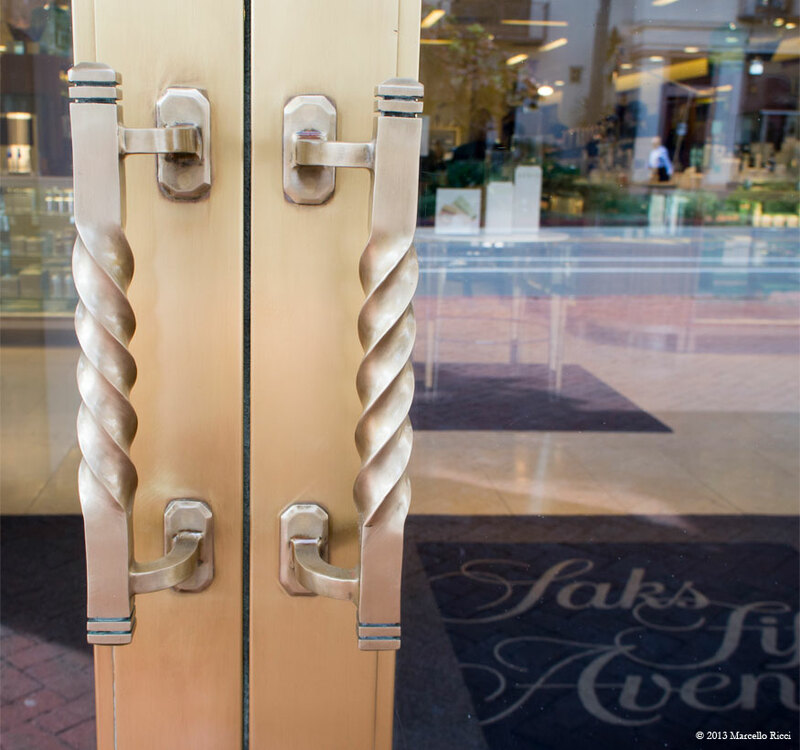 Saks Fifth Avenue Door Handles These door handles to Saks Fifth Avenue's Santa Barbara store were first created in wrought iron, then cast in bronze. The twists are left and right specific. 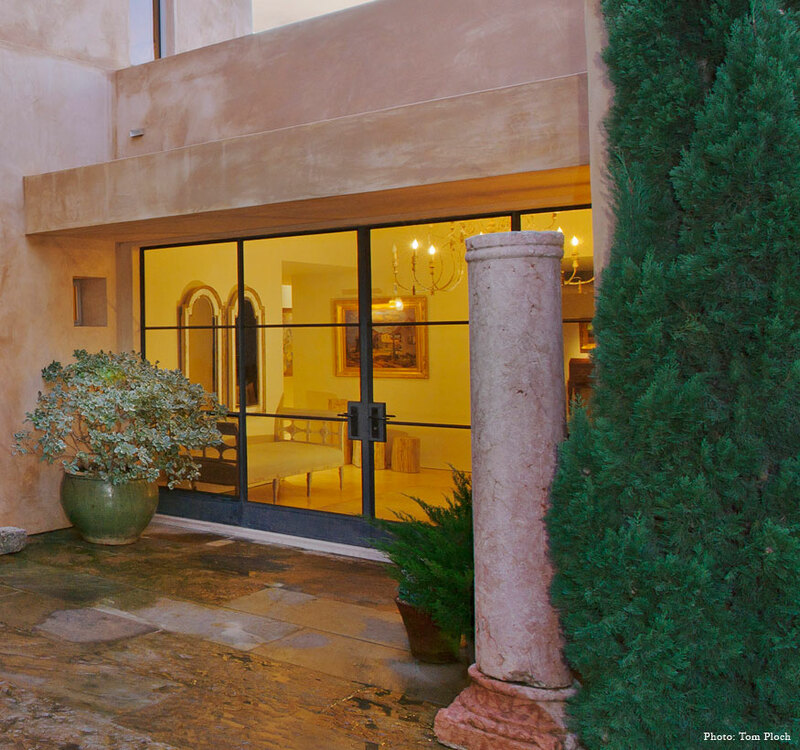 Iron Doors and Windows Custom built doors by Ironwood Designs provide security, light, and warm welcome at the entry to this elegant private residence in Montecito, California. 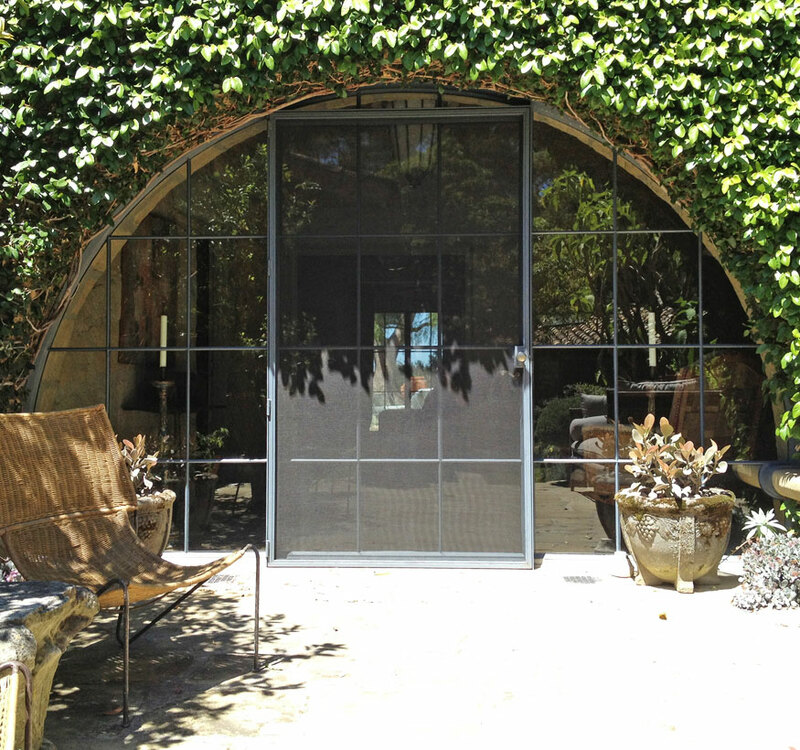 Iron Doors Custom door and window set built by Ironwood Designs. Single door panel in center, with stationary side lights, and low profile sashes across all. 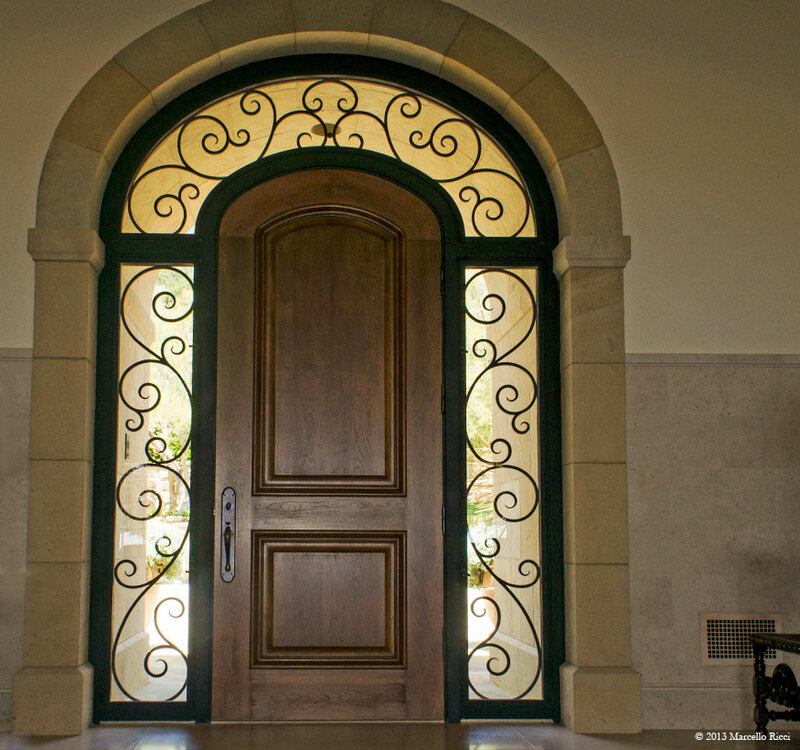 Arched Iron Door Neatly fitted into an existing, 80 year old stone arch with a mature vine, this iron door, built by Ironwood Designs, is water tight, beautiful, and built to last.